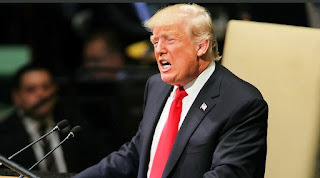 President Donald Trump has a message for international migrants in his remarks to the United Nations: make your countries great again. Trump addressed the global body Tuesday morning in New York City. Trump touted America’s progress since his election domestically and on the world stage. Trump specifically noted his administration’s muscular approach to immigration. The Trump administration has brought American migrant admissions to record lows and cut funding for refugee programs. Trump said the reason for the move revolves around American sovereignty. Read the rest of the storiy HERE.